The Rare Candy gallery is auctioning off 151 unique pieces of Pokemon flavored art to help raise money for the Canines for Disabled Kids charity. Do you like Pokemon? Do you like charity? How would you like to mix the two together and wind up with a morally justifiable excuse to spend a couple hundred dollars on a Pokemon art piece? Based at the Doodlebender website, the Rare Candy gallery is auctioning off original art pieces put together by 151 different artists, each doing their own version of one of the first generation Pokemon from the original Game Boy games. Proceeds from the auction, started by Peter Le and Amy Kim, will be donated to the Canines for Disabled Kids charity, which works to pair deaf and physically disabled children with trained service dogs. Le and Kim put the gallery together with students and friends participating in the Animation/Illustration program at San Jose State University. The two "recruited 151 artists and randomly assigned each artist one of the 151 original Pokemon," said the gallery's Doodlebender page. 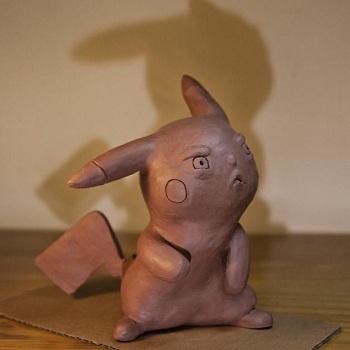 "The artists had the freedom to interpret their Pokemon in any way they wished." The results of the project are diverse, featuring drawings, paintings, sculptures, and perhaps the oddest interpretation of Bulbasaur ever concocted. The bids so far look to be running the gamut. Some pieces look as they'll sell for only a few dollars while others have already made it into the hundreds. There was a time in my life where I adored the original Pokemon Game Boy titles. There was just something about that first generation that felt special and now, looking at the art of the Rare Candy gallery, it's hard not to feel nostalgic about the hours I spent wandering through the brush, working to turn my useless Magikarp into an epic Gyarados. It almost makes me want to place a bid myself and purchase a constant reminder of those simpler days when "Gotta Catch Em All" ended with number 151.